For this OMReport Andre spoke with Brad Geddes. Brad is the author of the bestseller Advanced Google AdWords and belongs to the first Google Advertising Professionals and Microsoft adExcellence members. 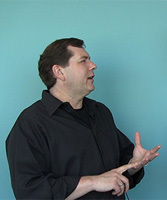 In 15 years in Online Marketing Brad worked as founder, consultant, trainer and tool provider. His Paid Search trainee program Certified Knowledge is widely known in US. If you prefer to read the interview, you will find a transcript of it on akm3.com. This interview is also available on iTunes and on Youtube as videocast.